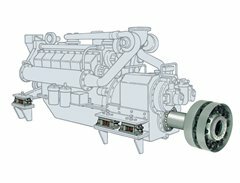 The “Soft-Mount” package was developed to provide excellent vibration and noise isolation for propulsion engines with integral gearboxes. The system is comprised of our BR-T type isolators that are designed to carry full propellor thrust without locking up (thus providing isolation over the entire speed range), and the RT coupling which is also designed to carry full propellor thrust. The RT coupling provides (1), adequate flexibility to reduce the bearing loads in the shafting and gearbox under dynamic motions of the engine (2) reduces noise and vibration produced from the engine and gear from being transmitted down the propellor shaft into the structure, and (3) absorbs propellor thrust pulsations. More information on the BR-T isolator and the RT coupling can be found on the products page. Some 400 vessels have been fitted with this system. Copyright © 2019 LO-REZ. All Rights Reserved.